As an approved Bobcat dealer, we understand that when our customers invest in a piece of this specialist machinery, they require a dedicated and reliable aftercare service that can assist them with any necessary repairs and the general maintenance of their machinery. Our professional, factory trained engineers have developed a complete and in-depth knowledge of all that we have to offer. 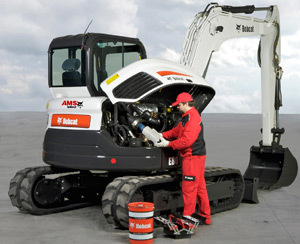 With our mobile services available to come to your site, and our workshop equipped with the most advanced diagnostic tools available, you can be sure that should your Bobcat require any attention, you can rely on our expertise to put it right with the minimum of fuss and downtime.